Living in a small New York City apartment means exercising extreme discernment when it comes to the addition of a new kitchen appliance. There simply isn’t a lot of space to go around, and most appliances are pretty cumbersome. Plus, there’s the issue of buyer’s remorse, or outgrowing an appliance once you’ve invested in it. I use nearly all of my appliances on a regular basis, but I can’t name the last time I used my juicer. For all of these reasons, I’ve been hesitant to add a slow cooker to my appliance collection, even though I’ve been curious about one for a long time. I started reconsidering it this fall, when I started up grad school again; I knew that being able to throw dinner ingredients together and allow an appliance to do the work would be a huge time-saver as I juggle clients and classes. So, when the folks at Hamilton Beach reached out to me about reviewing their new Programmable Stay or Go 6 Quart Slow Cooker, I was thrilled, and very interested indeed. The main purpose of this appliance is to make life just a little easier. You can program the slow cooker on either a low or a high setting for 2, 4, 6, 8 or 10 hours, then forget about it. The slow cooker will switch to a “warm” setting automatically as soon as cooking is done, so there’s no need for babysitting. It’s as simple as getting a recipe set up, then letting the slow cooker do it’s magic! Having this slow cooker is opening up a world of new vegan recipes, including some I’ve always wanted to try, such as slow cooker steel cut oats, slow cooker chili, slow cooker Cuban black beans, slow cooker applesauce, and so much more. When I got the slow cooker, I decided to order a copy of Robin Robertson’s Fresh from the Vegan Slow Cooker, which I’ve heard great things about. It’s a wonderful and accessible book, and I’m excited to explore it. For now, Pinterest and other online recipes are keeping me busy! I was fairly torn on what to prepare first, but I let my pantry guide me. I had a ton of Spanish pardina lentils at home; they’d been on sale at my local health food store, and I’m a big fan of their texture and size (a little bigger than beluga or Le Puy lentils, but they hold their shape better than regular green or brown lentils). So, that was my recipe base. 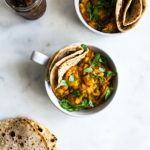 Because lentils go so nicely with Indian flavors, I decided to do a sweet, savory masala lentil dish: something halfway between soup and stew, a little less spicy than a curry but still very flavorful. And this recipe was born. Things I love about this dish: it’s creamy, hearty, and filling, while also being incredibly healthy (rich in minerals, high in protein, full of micronutrients, high in fiber, low in fat…the list goes on). Tomato paste and stewed tomatoes create a rich base–more memorable than using broth or water alone. I love that the dish features garam masala, and with it the characteristically autumnal aromas of cinnamon and cardamom (there’s some ginger in here, too). I love that this could be served on its own, as a stew of sorts, or over rice (which is how I’ve been eating it). And I love that the recipe makes a lot of food; this means that it’s a perfect choice for batch cooking and freezing, which is an essential habit for me these days! 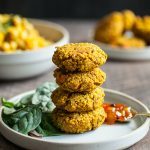 This recipe could easily be modified to include a different blend of spices or even different ingredients; I’m thinking that sweet potato would be a marvelous addition. But it’s great just as it is: an easy, low-stress, protein-rich, iron-rich, and highly nourishing meal. Stovetop cooking alternative method: Saute the onion in a little grapeseed or coconut oil till clear and tender. Add the garlic and ginger and cook for another minute or so. Add the remaining ingredients except for the coconut milk. Bring to a boil and reduce to a simmer. Simmer, covered, for 30 minutes. Remove the lid and simmer until the lentils are thick and resemble a stew (another 15-20 minutes). Stir in the coconut milk and serve. Leftovers will keep in an airtight container in the fridge for up to five days, and they can be frozen for up to 6 weeks. Many slow cooker recipes call for sautéing onion and garlic before adding them (along with everything else) to the slow cooker. I was torn on whether or not that step would be worth it for this recipe. 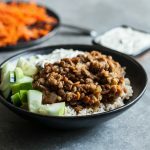 I’m sure that it makes a big difference in other recipes, but for this dish, simply adding all of the ingredients to the slow cooker and walking away was perfectly fine! And the resulting recipe has a lot of deep and rich flavor, so I don’t think it suffers from lack of browning the onions first. As you can see, I’m a little smitten with the slow cooking process, and you can expect to see more slow cooker recipes on my blog and in my Monday menu plans from now on! I’ll do my best to supply a stovetop alternative, though, whenever I possibly can. In the meantime, I’d love for one lucky reader to join in on the slow cooking fun with me! And fortunately for us, the folks at Hamilton Beach have kindly and generously offered to share a Programmable Stay or Go 6 Quart Slow Cooker with one Full Helping reader. Hooray! Simply follow the prompts below to enter the giveaway. I’ll run it for three weeks. US and Canadian residents only, please. The slow cooker reviewed in this post and the slow cooker being given away were provided to me at no cost by Hamilton Beach. All opinions expressed in this post are my own. Thanks for the giveaway! My first choice of recipe would be a hearty stew (most definitely with sweet potato in it!). Beans, so I can buy less canned. I’d love to make the recipe you talk about – sounds delicious! I want to try making desserts in a slower cooker! I found a recipe for chocolate peanut butter cake that looks yummy. This looks so amazing and perfect for the cold rainy weather I’ve been seeing lately! As for what type of recipe I’d like to make – either steel cut oats for an easy nourishing breakfast, or this masala lentils recipe! I would love to have a sow cooker! This recipe is what I would make, it looks so good! Just looking at pics of this Masala Lentils make me want it NOW!!!! Yumm!~Thanks so much for lovely ideas. I think I would use the slow cooker to making staples, like bbq sauces, tomato sauces, and beans. I love the idea of being able to set a button and forget about it. Ah, I’ve been thinking of getting a slow cooker for a while now, but I wasn’t sure that I would use it enough to justify the purchase. This recipe looks like a great start! I’d like to find a nice rice breakfast dish. It would be great to wake up to the wonderful scent of breakfast ready for the table. Cabbage and sweet onions would be first. Thanks for the chance! I want to try to make zucchini lasagna in my slow cooker if I win. I’ve always wanted to try a slow cooker as well! Imagine coming home after a long day of work to a delicious black bean stew ready to be devoured! I make it in a small cooker currently, using Anupy Singla’s recipe, but it’s so good it would be great to make a bigger amount at once. I would love to make your Butternut Squash Gratin! This slow cooker looks amazing! I’ve been dreaming of making a delicious curried butternut squash soup, it would be a so simple to prepare in the slow cooker too! I’m also curious about the slow cooker oatmeal, but I’d definitely be putting this to use for chili! I’d love to try a vegan potato soup. I haven’t made it since I started the omni to vegan transition, and it’s the right weather for soup! Ooohh I’d love to try this recipe in a slow cooker or perhaps a black bean stew recipe! I have this in my slow cooker right now! I’m excited to taste the finished product. I love my slow cooker and use it often. A Year of Slow Cooking has many recipes that are vegan or can be converted to become vegan. Some favorites are 21 Lentil and Sweet Potato Curry, Bombay Beans and Potatoes and Sweet Potato Chili. I would make vegan chili! This looks wonderful! I’d love to see some recipes for braised tempeh, too! I loved my slow cooker! It recently decided that it had enough and quit working on me! It stopped turning on and if you were able to get that far it would turn itself off when trying to program it! It’s about 11 years old and well loved! Slow cooker warm porridge on winter mornings sounds just delightful! Thanks for the new recipe. This would be great! I’ve always wanted to make apple butter in a slow cooker. This was delicious! I had it last night. Mmmmmmm!!!!!! Can’t wait to eat the leftovers. I have a great vegan tortilla soup recipe that would work wonderfully in this! I love to make Beef Stew! I’d like to try making desserts in the slow cooker. I’ve seen so many good ones! I would love to own a slow cooker so I can have nice warm meals when I get home from work! I love recipes just like this one. Would love to make channa masala! I’d love to make this masala recipe. Mmmm, I just love curries! Being a college student, space and time are two things I don’t have a lot of. I could whip up some yummy curry dishes with this perfect addition to my quaint (and cramped…) dorm. And my roommate would be happy! 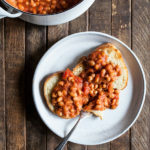 Would love a new slow cooker with a timer- that seems like a great feature for beans when I am running late from work!! I want to make vegan chili ! The madras lentils sound (and look!) delicious. I don’t have a slow cooker so I’m often having to pass over recipes that call for them. It would be great to remedy that! Your lentil recipe looks yummy! I’ve never cooked oats in a slow cooker so that would be what I would want to try first. It would be nice to have breakfast ready in the mornings. 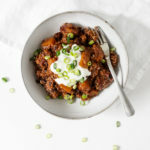 This is the first recipe I’ve made from this blog, and I am officially obsessed with it as well as slow-cooker recipes in general. I looked at my husband and said, “Seriously, it’s this easy? !” I will definitely be doing this for beans/soups/chilis on a weekly basis, so thank you! Thank you, Brittany! I’m so glad you liked it. I must admit, having a slow cooker has really been an incredible asset in the last two weeks, and I’m quickly falling in love with mine. I’ll be sure to keep sharing my favorite recipes! I don’t have a slow cooker/crock pot. (Is there truly a difference???) Which feels sort of blasphemous. I’ve been looking into getting one, so this seems very fortuitous. Fingers crossed! Also, that looks absolutely delicious. It’s gonna have to be one of the first recipes I try once I actually have a slow cooker. I would try the masala lentils recipe you posted, sounds good! I haven’t made a lot of slow-cooker recipes… but I’m a college student and we’re coming up on finals crunch time here… anything that could save me time is definitely worth trying! Whipping up a big batch of these masala lentils would last me all week! They look delicious! I love to do a chili with quinoa. I’d do that first. Oh! this looks perfect. So I am going to try this now. Thanks for sharing. In my really old crockpot now! looking for a substitute to tamarind now. I have so many recipes I would love to try, but maybe first a vegan mac and cheese. Yummy. I would definitely make more bean stews this winter like my favorite ribollita recipe! I want to try African Peanut Stew! I just made this recipe and my house smells amazing!! Looking back I wish I wouldn’t have added additional liquid in the last hour because once the coconut milk was added it became more like a loose stew and I wanted it a bit thicker. You live and you learn. The only modification I’d make in the future would be to add in some chopped up jalapeno. I didn’t have any on hand and instead added a few heavy shakes of cayenne- but that’s for my personal taste. With all that said, this recipe is delicious! I enjoyed this recipe mostly because it was very easy to make and I had all the ingredients already in my pantry. In my opinion it had good flavor; however, my husband didn’t like it as much. So very sad! I will have to change it – maybe by adding a few more veggies and changing the spices a little bit (for us it was a bit salty). On its own, I thought this recipe was pretty bland and it took WAYY longer than expected for the lentils to fully cook in the crock pot unfortunately. (7hrs on high) I ended up making a few adjustments. I doubled the amount of garam masala, and maple syrup. At the end, I added full fat coconut milk instead of low fat and served it all over some brown rice, with a side of achaar to spice things up. With those changes, we enjoyed our meal and had tons of leftovers, so we took your advice and froze some of it in individual portions for lunches. Can red lentils be used instead o the lentils mentioned in the recipe? Would the cooking time change? I’m not sure. I think the cooking time would be shorter, as red lentils cook more quickly, but I suspect I’d need to try it for a precise estimate! You could try cooking on high and keeping an eye on it to make sure it’s cooking the way you want it to. Thanks, Gena! That’s exactly what I was thinking. I am sitting enjoying this dish as I post. I froze a good part of it because it yields a lot. It is so delicious and easy. One tweak, I took all of the spices and sautéed them along with cumin seeds in a bit of coconut oil. Once this became fragrant, I popped it all into the slow cooker. The best part of this recipe was, I had everything I needed in the house. Thank you for a wholesome, hearty, easy recipe. A good base recipe. I would recommend doubling the garam masala, adding cumin, curry powder and chilli powder. This gives it more flavour and kick. I think it would be best to precook the onions and garlic, they come out a bit crunchy even after six hours cooking. Otherwise the recipe is really good. If you aren’t available to add the coconut milk later during the cooking process, could it be added at the beginning instead?